Get involved by organizing a fundraiser! Organize a bake sale, a yard sale, a spaghetti dinner or other fundraiser in your community to spread the word about Haiti School Project and raise money for the school. Organize a dinner with your friends and charge money per plate or just give out information about the organization and our projects. Be creative! Every little bit helps and we are always looking to spread the word about Haiti School Project! Contact Tim Myers at tim@haitischoolproject.org if you are interested in setting up a fundraiser in your community! You can make a post about us on your favorite social networking site with a link to our website or “Like” us on Facebook at http://www.facebook.com/HaitiSchoolProject! You can also sign up for our newsletters and even share them with your friends! We are always looking to get more people interested in our projects and we could use your help to do it! 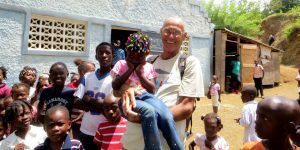 Donate your frequent flyer miles to Haiti School Project. This would be a big help for us in travelling to and from Haiti. Thank you. Email us with your ideas on how you can help: tim@haitischoolproject.org.